"Serenity" instantly transforms your environment into a safe soothing place for your soul to relax. This DVD could be used to help you sleep or to reduce anxiety and calm you at the end of a stressful day. You can experience a variety of moods and seasonal portraits set to music. Summer is filled with plants growing, flowers blooming and surf crashing against rocks with beautiful sunsets. Nature becomes animated as you can literally watch grass grow and nature renewing itself after a long winter. In the ocean scenes there is a soft sway of an underwater garden. Winter has an especially beautiful purity and the clarity of the music is enhanced by softly falling snow and snow-laden branches. Christmas music plays for a few minutes on this DVD and brings a sense of peace and soothing memories. Sweetly serene moments almost reach a poetic perfection as waterfalls cascade from great heights as sounds from nature enhance the soothing music. I especially enjoyed the sections set to classical guitar. "Serenity" works as well as being out in nature or by the ocean watching the waves. If you love this Moodtape you may also want to look for Autumn Whispers, Tranquility, Ocean Reflections, Whispering Water, Pacific Surf, Romantic Classics or Contemporary Christmas. 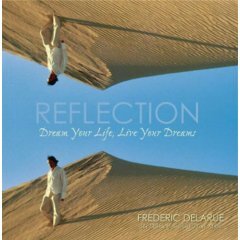 Frederic Delarue's sweetly melodic symphony of healing touches the soul and creates a tranquil place for reflection. "Reflection Dream Your Life, Live Your Dreams" is soothing and brings out beautiful feelings of love and compassion. A sense of unconditional love and acceptance transcends all other emotions to lift the spirits and bring you to a place of safety and comfort. At times mysterious, the melodies weave calm into your daily existence and provide a place to rest on an emotional level. The minute I play a Frederic Delarue CD my day is transformed into a beautiful vast expanse of peace. If you are looking for music to awaken your inner joy and give you a sense of calm, then "Reflection Dream Your Life, Live Your Dream" offers quiet meditative moments to instantly transport you to a place of peace. I can also highly recommend Voyage of the Soul, Soaring with the Angels, Symphony of Light and Dophins...A Message of Love. Frederic Delarue is also featured on the benefit album Cousteau's Dream along with Yanni, Kenny G, Kitaro and Vangelis. He was born in Chartres, France, so, it is no wonder his music embraces the heights of the spiritual experience all while remaining grounded in a sense of profound moments of joy as experienced here on earth. 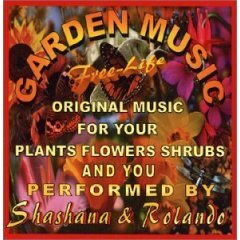 Created for plants, Garden Music is also delicately soothing for humans and animals. The original music is created with a synthesizer and guitar. Garden Music is also designed to nourish and heal. This beautiful music is performed by Rolando and Shashana. They specialize in a type of healing called "sacred sound healing." This helps to align and balance the body, mind and spirit of the individual listening to the music. You can feel the effect of the music almost immediately as it creates a soothing space to relax. Rolando has been a musician for over twenty-five years and also knows a great deal about music therapy. Shashana, who loves Italy in the fall, has been playing the piano and organ since the age of six. Both musicians have studied music and also draw on their experience as musicians to create this beautiful escape which is a blending of exotic world music, classical meditations and jazz. If you enjoy guitar, piano, organ, cello and violin then I think you will enjoy the soothing comfort as you float away on rivers of melodious meditations. If you enjoy music by Yo Yo Ma, Secret Garden, Pat Matheny, Acoustic Alchemy of music by French Impressionist composers like Satie and Faure then you will appreciate the smooth jazz sounds blended with a classical appeal.